London, UK – The UK has been a top destination for investor visa applications from wealthy individuals (those with a net worth of more than $1m) - over the past decade, according to Knight Frank’s Wealth Report, which includes exclusive data provided by global immigration specialist Fragomen. Over the decade to 2013 (latest data) the UK saw the arrival of 114,100 High Net Worth Individuals (HNWIs), compared to Singapore, with 45,000. More than 60% of these individuals originated from Europe, but with substantial numbers also coming from China, Russia, India, the Middle East (especially Saudi Arabia, Syria and Turkey) and Africa (led by South Africa, Nigeria and Egypt). 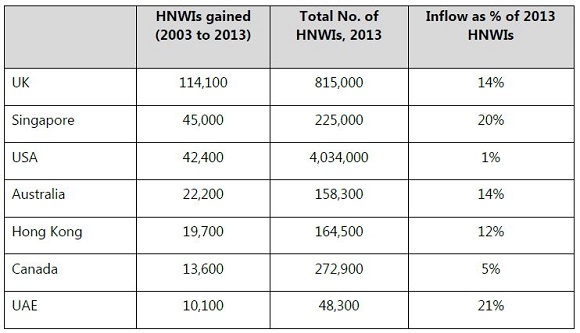 In Asia, Singapore has seen strong migration of HNWIs from China, India and Indonesia. Flows into the US predominantly come from the UK, India and Russia; although Fragomen notes that the US EB5 programme saw record applicant numbers from China in 2014. Demand for entry to Australia has been boosted by strong inflows from across the Asia-Pacific region (India, China, Indonesia), as well as the UK, Europe and South Africa. 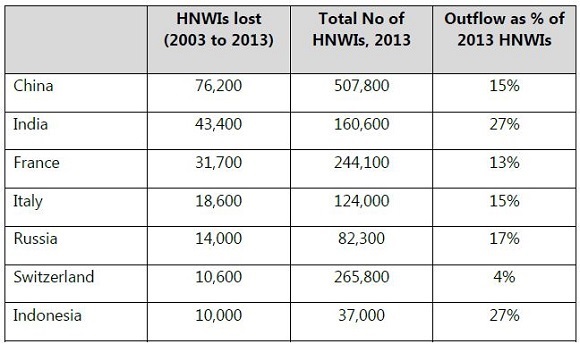 Unsurprisingly, Hong Kong’s now closed CIES programme saw most of its new HNWIs come from China. “India’s wealthy migrants tend to favour the UK, the US and Australia. French and Italian HNWIs prefer the UK and Switzerland. Some 73,000 Russians received foreign passports in 2013/14, the majority of the HNWIs amongst them focussing on the UK and the US. Nigerians have been a growing source of demand for high-value investor programmes, with the Citizenship by Investment Program of the Federation of St. Kitts and Nevis a notable target.